-Half length Zorro II card. 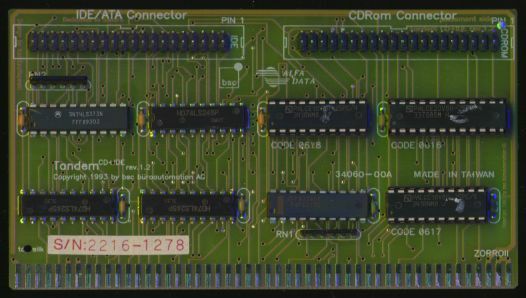 This card supports any IDE device and ATAPI device connected to its IDE controller. It uses (oktagon.device) for IDE devices and (tandemat.device) for ATAPI devices. The Mitsumi controller is actually a custom controller based on IDE made by Mitsumi. These controllers are normally found on PC sound cards and allow a way of adding a CDROM without wasting any IDE ports. Only CDROMS of the Mitsumi type can be used on the Mitsumi controller. They use tandemcd.device.